Get off at Tezukayama 3-chome station of Hankai Uemachi Line, and walk to the west for a few minutes. 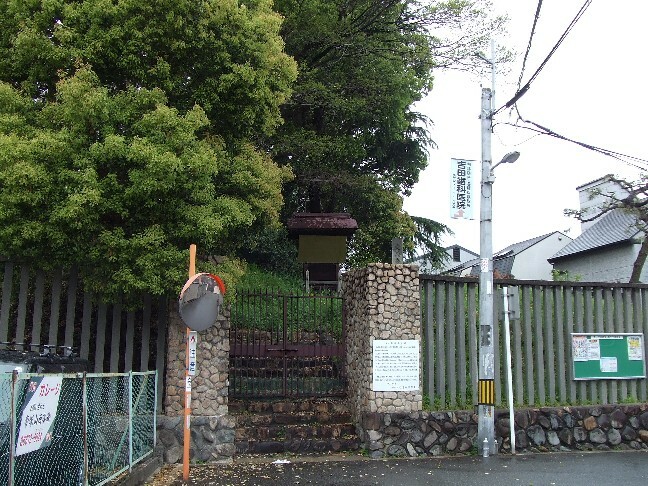 Soon after you go across Nankai Koya Line, you will reach this tumulus. This tomb was built in 6th century. 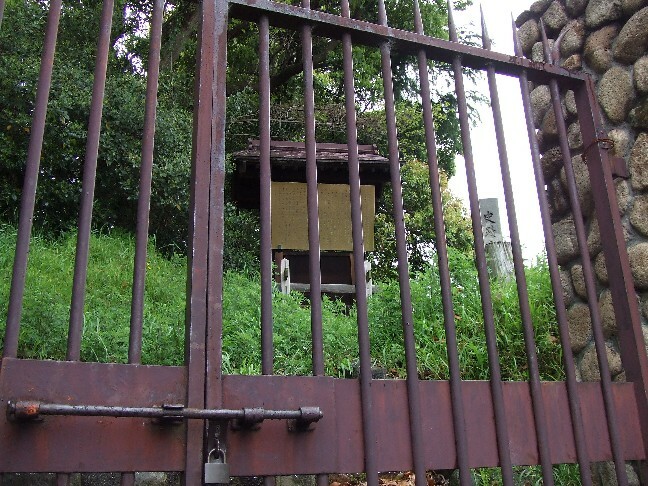 It is said that Ootomo no Kanemura was buried. 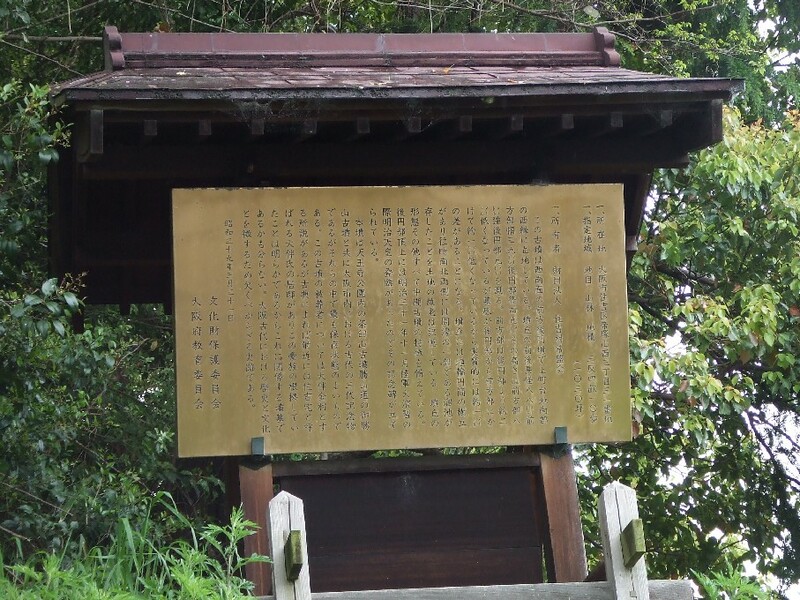 Ootomo family supported the emperors in those days. It looks like a woods on a hill. Unfortunately, like most of other ancient tombs, you can’t go inside. This is one of three ancient tombs in Osaka City, and is surrounded by rich, quaint, and quiet atmosphere of big and luxurious houses. 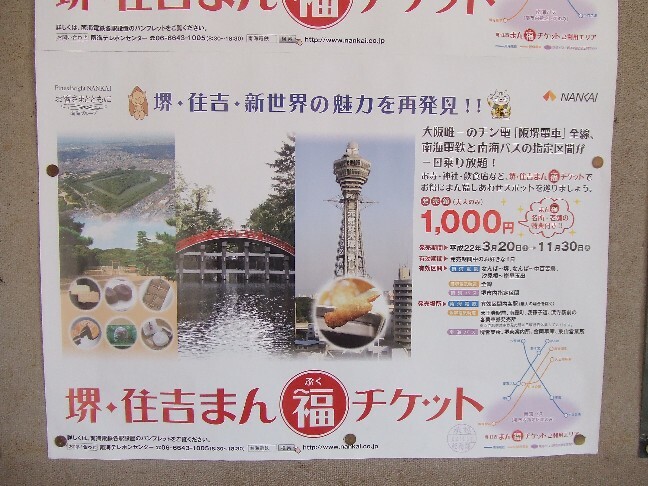 From March 20 until November 30, 2010, you can get a special one day pass called “Sakai Sumiyoshi Manpuku Ticket” for Nankai Lines, Hankai Line (tram), and Nankai bus for 1,000 yen. You can use :between Namba and Sakai of Nankai Main Line, between Namba and Nakamozu, and between Shiomibashi and Kishinosato-Tamade of Nankai Koya Line: all through Hankai Line, and designated stops of Nankai Bus. You can also get a booklet about Sakai, Sumiyoshi, and Shinsekai, written in Japanese on purchase. 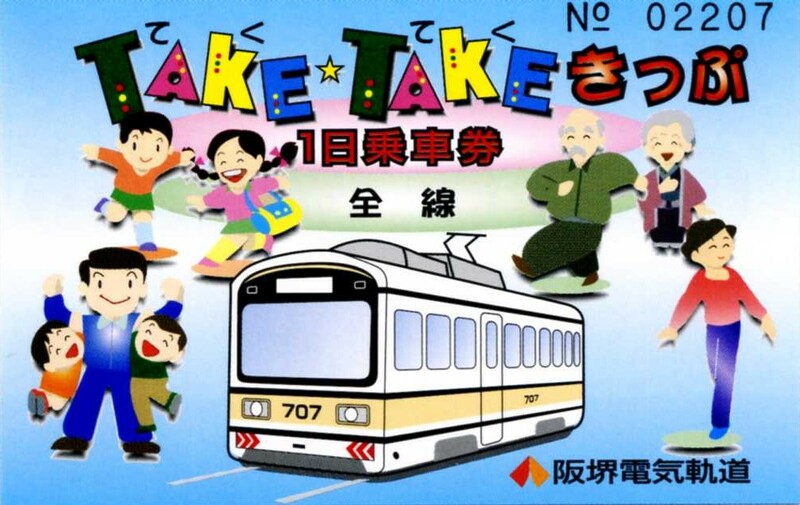 You can purchase at each Station of Nankai Lines, and box offices of Tennnoji Minami Kasumi-cho, Abikomichi, Hamadera Ekimae Stations and at some offices of Nakai Bus. Fare of Hankai Tram is 200 yen one way in Osaka City, and 290 yen when you go across over the Yamato River and go into Sakai City. You want to pay to the tram driver when you get off. 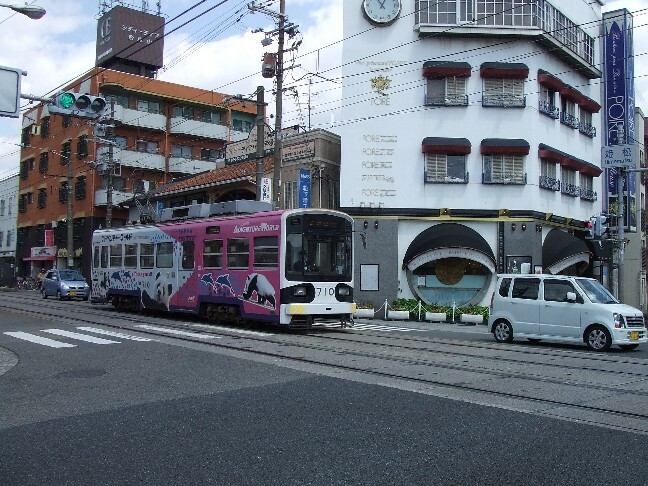 There are many historical sights along Hankai Tram, and you can also see the actual Osakans’ everyday lives. For tourists, I recommend to purchase called “teku teku kippu”, which is one day pass, for 600 yen for an adult, and 300 yen for a child. You can purchase at the box offices at Tennnoji Ekimae Station, Minami Kasumi-cho Station, Abikomichi Station, and Hamadera Ekimae Station. Or you can also purchase from the driver when the tram is stopping. You need to open, and scratch the date you are riding inside. For example, today’s date is April 20, 2010. 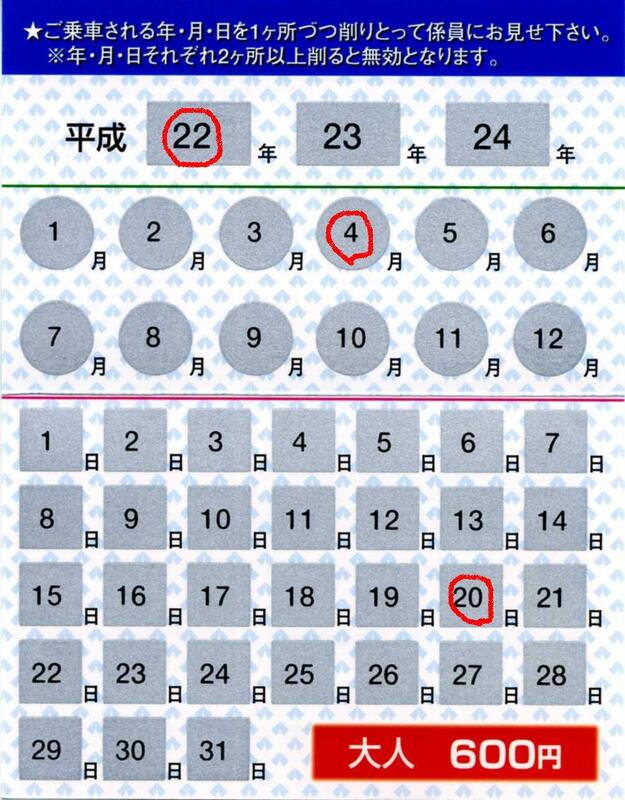 2010 A.D. is the 22nd year of Heisei（平成）, so scratch 22 on the top. Next, scratch 4 for April, the fourth month of the year, and scrach 20 for the 20nd day of April. Be careful when you scratch. If you scratch double or more for each part, it is going to be invalid! Show the inside of the card to the driver each time you get off. It goes from Osaka City to Sakai City. There are Hankai Line from Ebisu-cho, and Uemachi Line from Tennoji Ekimae Station, and they connects at Sumiyoshi Station when you go down toward Sakai City. 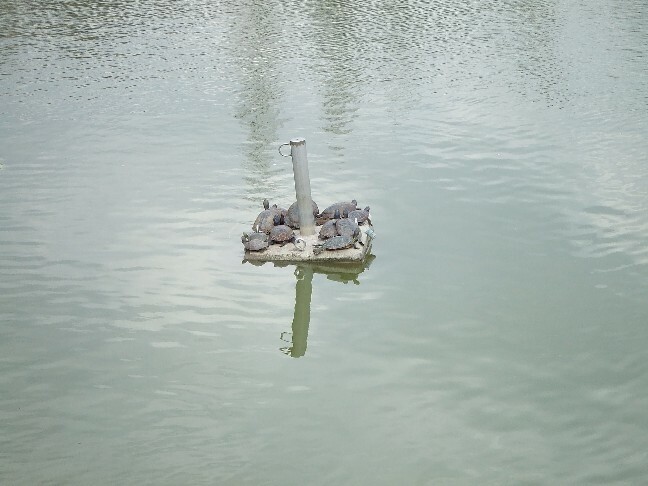 There are three small islands on Mandai Pond. The bridge leads to one of the islands. 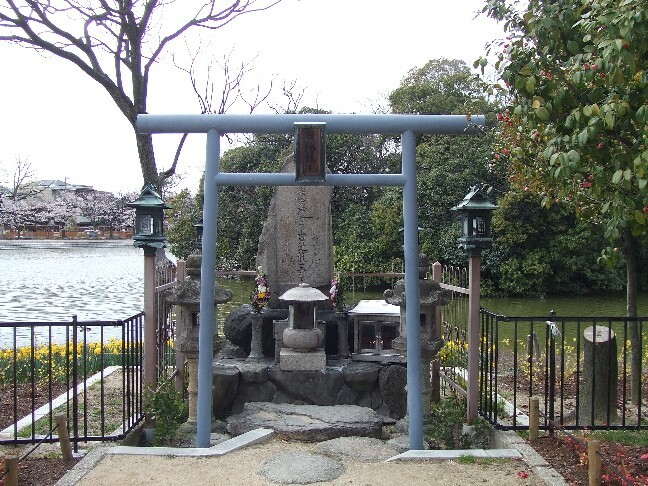 I went there for the first time, and found a small shrine which says “Furuike Jinja” which means old pond shrine. 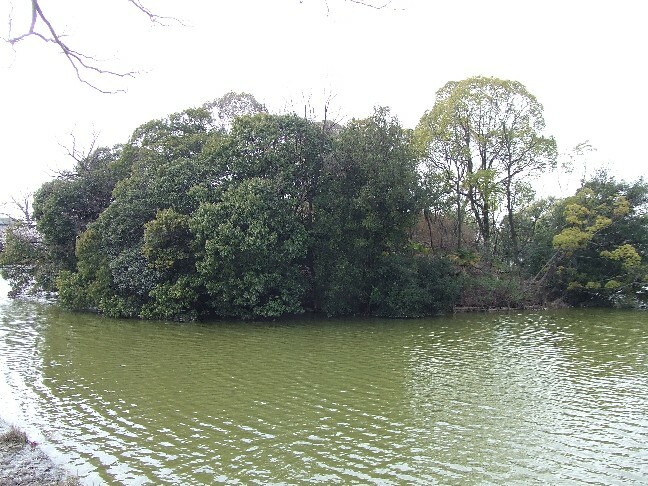 There is a legend that Shotoku Taishi(571?~622) who supported the Empress at that time, defeated the dragon at this pond. Maybe it has something to do with this small shrine, or maybe not. You can see turtles too! 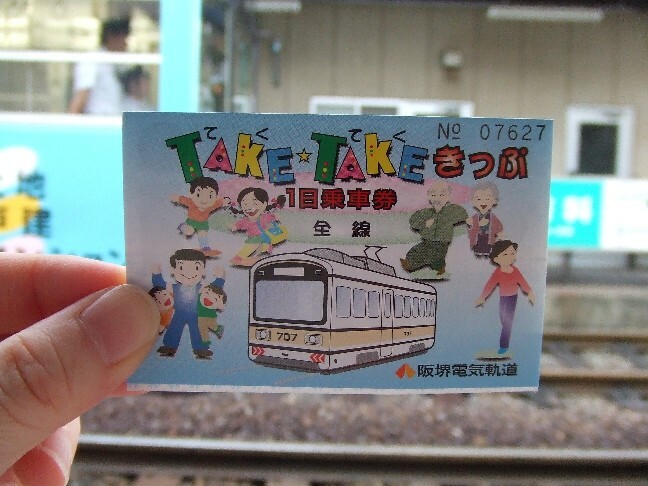 To go to Mandai Ike Park, get off at Tezukayama 3-chome Station of Hankai Uemachi Line. Go to the east. 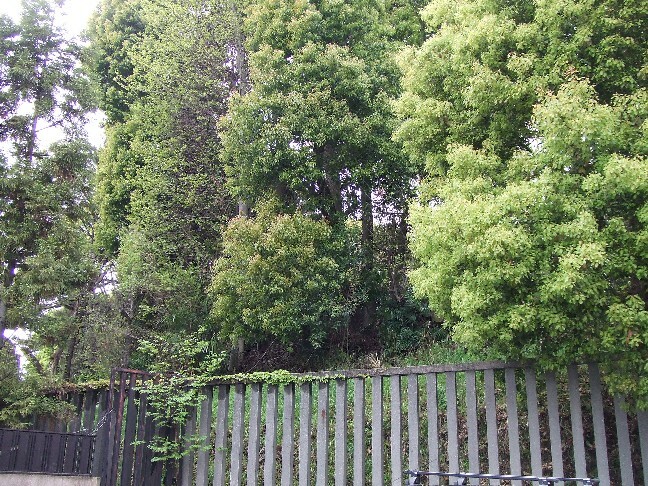 It is about three minutes walk from the station. In general, Japanese like cherry blossoms. 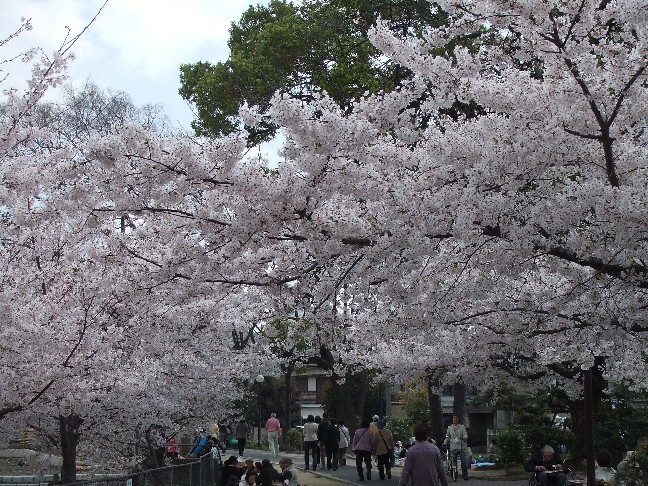 People get happy when they just see cherry blossoms. 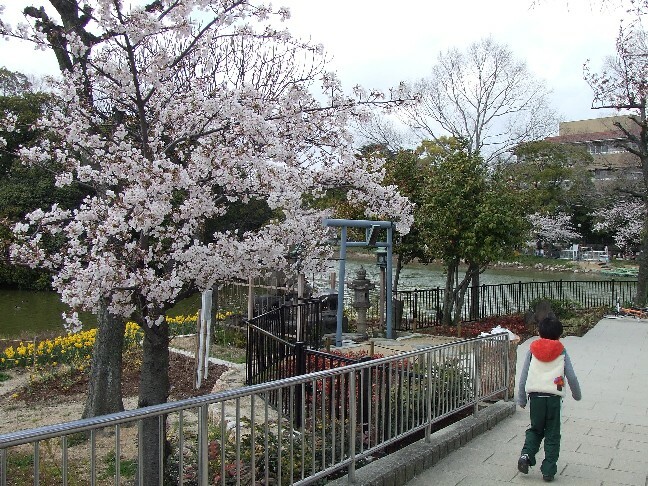 Mandai(or Bandai) Ike Park is famous for beautiful cherry blossoms. This is how people want to do under the cherry blossoms. It is a big event of the year. 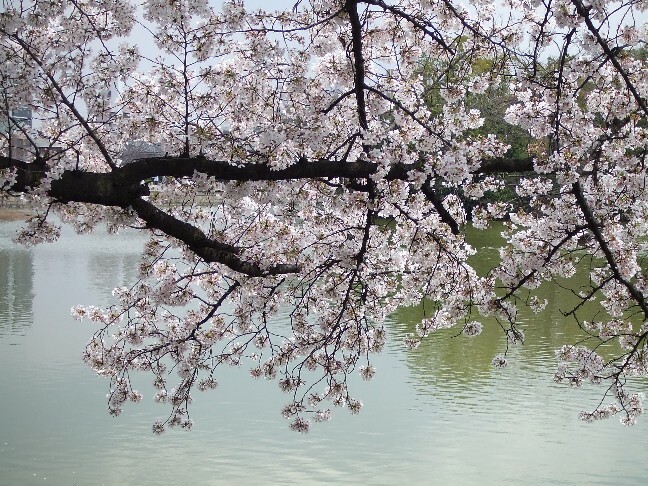 Cherry blossoms are the reason. 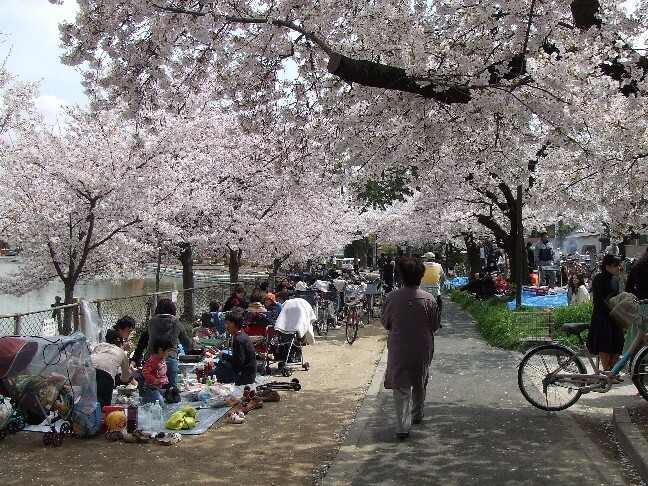 At night, even in the chilly weather, some people eat and drink under the cherry trees. I missed the pictures of the night.